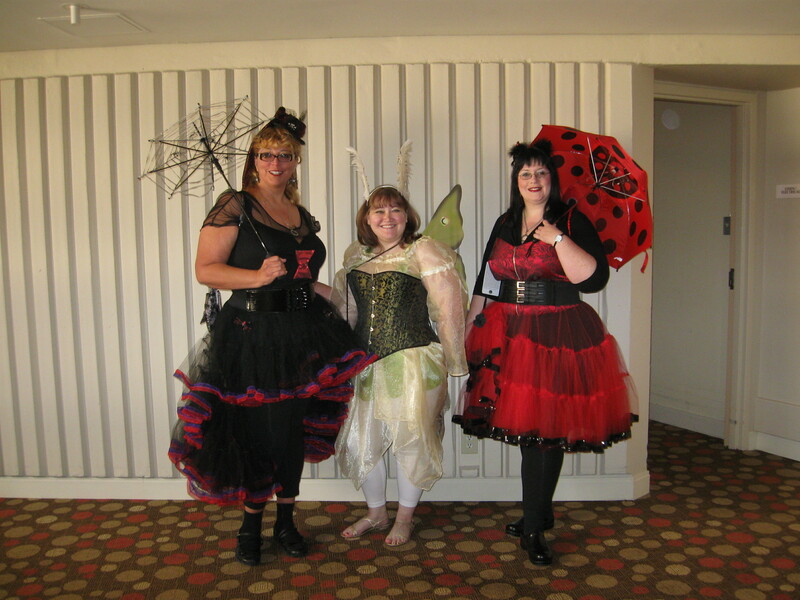 The idea for the parasols with our costumes originally came last year when Gothphyle baked in the sun while waiting in line for a panel at DragonCon. Gothphyle is a delicate southern flower and seriously, you can watch her skin burn. We talked back then of getting her a parasol for this year. When Meg and Jamie started talking about making parasols I thought I could create something for each bug to carry. 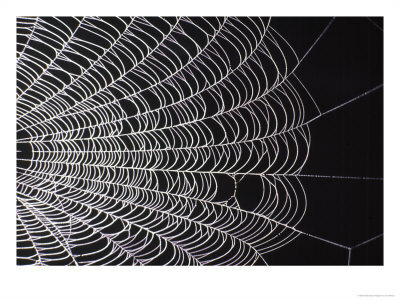 But when I looked at ‘web’ fabric I wasn’t moved. Too cutesy, too tiny, too meh. Finally I realized that I thought Vic needed a Vic size web. Part of the idea came from Summerset’s blog where she describes creating appliques with a wood burning tool. The heat seals the edges of synthetics. Don’t try silks or cottons, they just burn. Giving her the choice between an innie or outie web, both real spider options, Vic chose an innie style. I first drew it out and traced it onto the nylon cover I had already cut down to fit a trimmed parasol. Unfortunately, my first sample fell apart. It seems that the nylon didn’t have the strength at only a few centimeters wide to withstand the umbrella ribs. Next step was to reinforce the web with string. I found a silver crochet yarn that had a lovely sparkle and just fed it under my sewing machine foot as I traced the design with a wide zigzag. Then I trimmed the ‘holes’ out and using a soldering iron (because I don’t have a wood burning tool) I carefully cleaned up the edges, sealing them. I don’t recommend a soldering iron, I think they are much hotter than a wood burning tool and I ended up with some black edges. No problem for us, as it added a creepy edge. Just as Summerset mentions, do this in a well-ventilated area. Burning plastic smells like burning plastic, yuck, and can’t be good for any part of you. Once I finished, I re-attached the tips to the previously spray-painted black skeleton and in the end we attached some spiders to web. Good – I love the design and it ended up being pretty easy to make. Bad – It is tricky to open up. 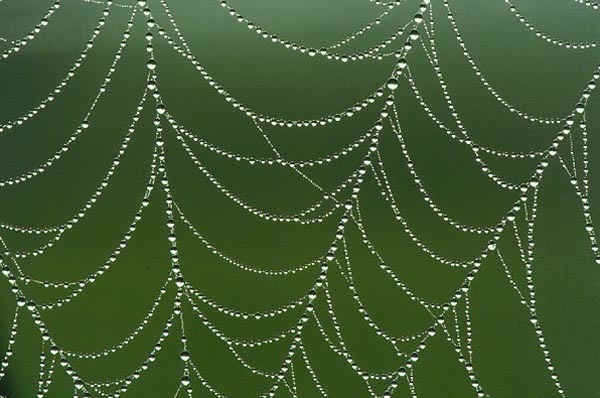 The web strings get tangled when it is all folded up. It took some practice to master. We also needed to do a better job with the spiders, some escaped during D*Con. Hopefully going on to scare some drunks. A girl can dream. And yes, we know that parasol isn’t going to protect anyone from the sun, but Vic is the sun worshiper of the crew so it was perfect. Still recovering from the weekend but wanted to get the first picture up. More to come. This was our ‘main’ costume this year. The idea was to use the crinoline agian. So, we chose a bug theme. 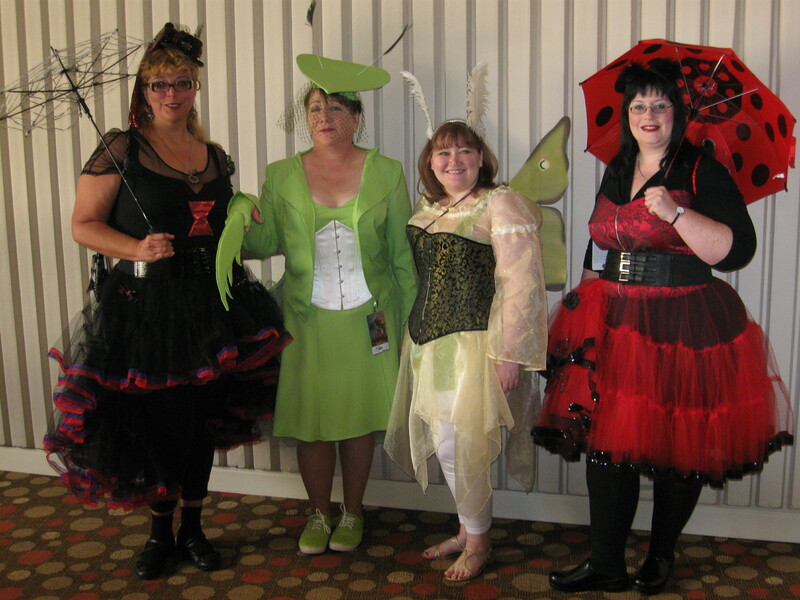 It is hard to see but mine is used as my bustle with tux tails hanging over it. You can also take peek a the web parasol I did for the black widow costume. Very fun. Directions coming.